This is not the first time of such a rapid new discovery is published within days of an article I produced outlining my hypothesis and what is likely to come next. 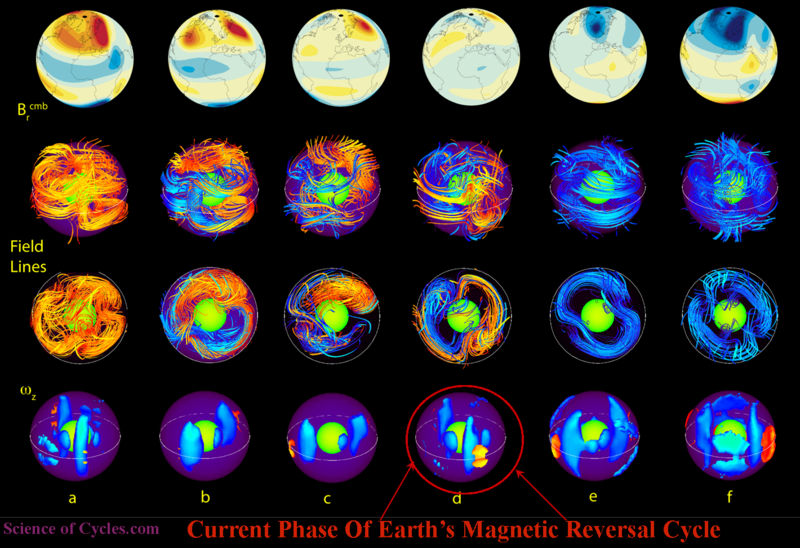 Just two days ago I sent out my article titled New Study Reinforces Cyclical Magnetic Pole Reversals telling of the various descriptive patterns which have been shown to fit short and long term reversal cycles. 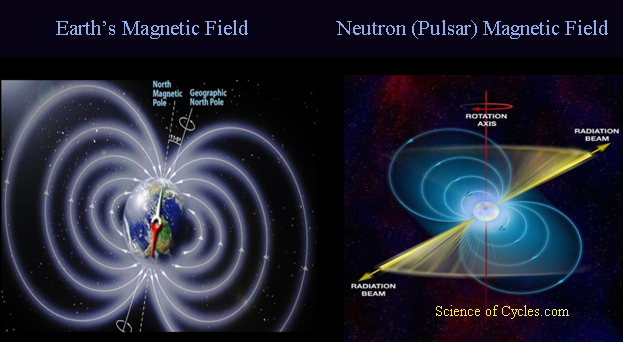 In an upcoming article later this week, I will describe signs and symptoms during the process of a full magnetic reversal which fits the pattern of historic cycles over what would be described as a ‘moderate’ time period, geologically speaking, covering a few hundred thousand years. 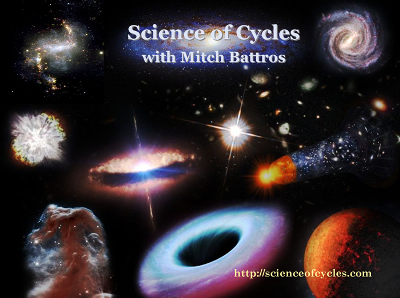 There is also a longer term cycle which covers a few million years; however, there is also a short term cycle which occurs approximately every 40,000 years. What I believe to be one of the most important questions, or should be, where in this current cycle are we today? My research covering the galaxy-sun-solar system connection which involves the discovery of various term cyclical events, suggests we are far along the process with just a few decades away from a significant excursion or full reversal. I would suggest we are deep into the cycle, and perhaps far enough along to witness (and sense) magnetic north bouncing around the northern hemisphere above 60° latitude and swing down between 30° east and 30° west longitudes. Perhaps a most intriguing thought, is the idea that many of you are young enough to witness a phase of pronounced swings in both latitude and longitude within the next 50-60 years. 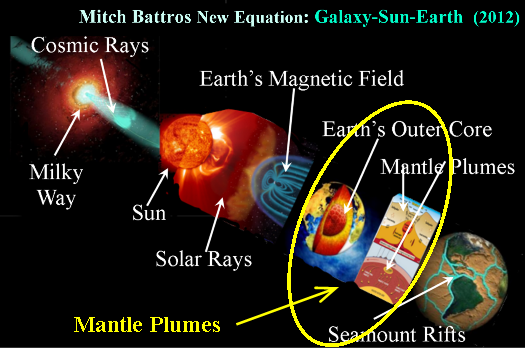 In today’s news, the discovery of two massive mantle plumes, residing on opposite sides of our planet. They sit next to or directly on the inner core approximately 1,800 miles (2,896 km) deep. This would be just the type of massive plume which could create a wobble as it goes through its natural process of convection. Arizona State University scientists Edward Garnero, Allen McNamara and Sang-Heon (Dan) Shim, of the School of Earth and Space Exploration head up the team, and their work appears in the June issue of Nature Geoscience. “We believe our finding will help explain the plumbing that leads to some massive volcanic eruptions, as well as the mechanism of plate tectonics from the convection, or stirring, of the mantle. This is the geo-force that drives earthquakes. 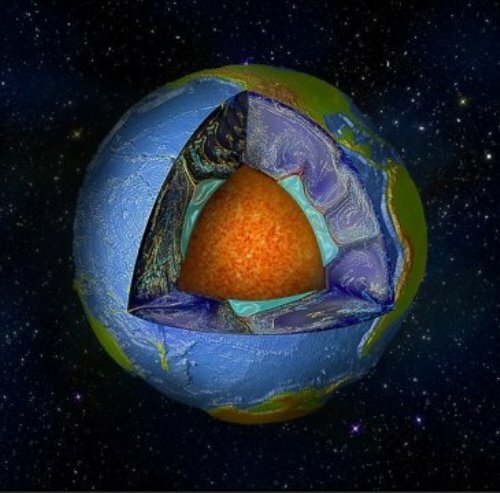 Earth is layered like an onion, with a thin outer crust, a thick viscous mantle, a fluid outer core and a solid inner core. The two plumes sit in the mantle on top of Earth’s core, under the Pacific Ocean on one side and beneath Africa and the Atlantic Ocean on the other. Waves from earthquakes passing through Earth’s deep interior have revealed that these plumes are regions where seismic waves travel slowly. The mantle materials that surround these regions are thought to be composed of cooler rocks, associated with the downward movement of tectonic plates. 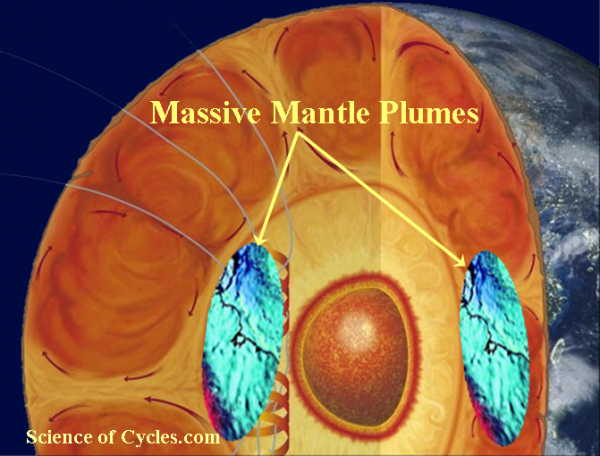 The plumes, also called thermo-chemical piles, have long been depicted as warmer-than-average mantle materials, pushed upward by a slow churning of hot mantle rock. The new paper argues they are also chemically different from the surrounding mantle rock, and may partly contain material pushed down by plate tectonics. They might even be material left over from Earth’s formation, 4.5 billion years ago. Much is yet to be learned about these plumes. But the emerging view from seismic and geodynamic information is that they appear denser than the surrounding mantle materials, are dynamically stable and long-lived, and have been shaped by the mantle’s large-scale flow. The scientists expect that further work on the two deep-seated anomalies will help clarify the picture and tell of their origin. “If a neuroscientist found an unknown structure in the human brain, the whole community of brain scientists, from psychologists to surgeons, would actively pursue understanding its role in the function of the whole system,” Garnero said. Scientists led by Durham University’s Institute for Computational Cosmology ran the huge cosmological simulations that can be used to predict the rate at which gravitational waves caused by collisions between the monster black holes might be detected. The amplitude and frequency of these waves could reveal the initial mass of the seeds from which the first black holes grew since they were formed 13 billion years ago and provide further clues about what caused them and where they formed, the researchers said. The research is being presented today (Monday, June 27, 2016) at the Royal Astronomical Society’s National Astronomy Meeting in Nottingham, UK. It was funded by the Science and Technology Facilities Council, the European Research Council and the Belgian Interuniversity Attraction Poles Programme. The study combined simulations from the EAGLE project — which aims to create a realistic simulation of the known Universe inside a computer — with a model to calculate gravitational wave signals. Two detections of gravitational waves caused by collisions between supermassive black holes should be possible each year using space-based instruments such as the Evolved Laser Interferometer Space Antenna (eLISA) detector that is due to launch in 2034, the researchers said. In February the international LIGO and Virgo collaborations announced that they had detected gravitational waves for the first time using ground-based instruments and in June reported a second detection. As eLISA will be in space — and will be at least 250,000 times larger than detectors on Earth — it should be able to detect the much lower frequency gravitational waves caused by collisions between supermassive black holes that are up to a million times the mass of our sun. Current theories suggest that the seeds of these black holes were the result of either the growth and collapse of the first generation of stars in the Universe; collisions between stars in dense stellar clusters; or the direct collapse of extremely massive stars in the early Universe. As each of these theories predicts different initial masses for the seeds of supermassive black hole seeds, the collisions would produce different gravitational wave signals. This means that the potential detections by eLISA could help pinpoint the mechanism that helped create supermassive black holes and when in the history of the Universe they formed. Lead author Jaime Salcido, PhD student in Durham University’s Institute for Computational Cosmology, said: “Understanding more about gravitational waves means that we can study the Universe in an entirely different way. “These waves are caused by massive collisions between objects with a mass far greater than our sun. Co- author Professor Richard Bower, of Durham University’s Institute for Computational Cosmology, added: “Black holes are fundamental to galaxy formation and are thought to sit at the centre of most galaxies, including our very own Milky Way. “Discovering how they came to be where they are is one of the unsolved problems of cosmology and astronomy. Gravitational waves were first predicted 100 years ago by Albert Einstein as part of his Theory of General Relativity. The waves are concentric ripples caused by violent events in the Universe that squeeze and stretch the fabric of space time but most are so weak they cannot be detected. LIGO detected gravitational waves using ground-based instruments, called interferometers, that use laser beams to pick up subtle disturbances caused by the waves. eLISA will work in a similar way, detecting the small changes in distances between three satellites that will orbit the sun in a triangular pattern connected by beams from lasers in each satellite. In June it was reported that the LISA Pathfinder, the forerunner to eLISA, had successfully demonstrated the technology that opens the door to the development of a large space observatory capable of detecting gravitational waves in space. Astronomers have combined data from NASA’s Chandra X-ray Observatory, the Hubble Space Telescope and the National Science Foundation’s Karl G. Jansky Very Large Array (VLA) to conclude that a peculiar source of radio waves thought to be a distant galaxy is actually a nearby binary star system containing a low-mass star and a black hole. 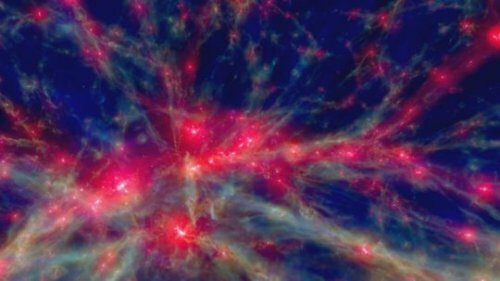 This identification suggests there may be a vast number of black holes in our Galaxy that have gone unnoticed until now. For about two decades, astronomers have known about an object called VLA J213002.08+120904 (VLA J2130+12 for short). Although it is close to the line of sight to the globular cluster M15, most astronomers had thought that this source of bright radio waves was probably a distant galaxy. Thanks to recent distance measurements with an international network of radio telescopes, including the EVN (European Very Long Baseline Interferometry Network) telescopes, the NSF’s Green Bank Telescope and Arecibo Observatory, astronomers realized that VLA J2130+12 is at a distance of 7,200 light years, showing that it is well within our own Milky Way galaxy and about five times closer than M15. A deep image from Chandra reveals it can only be giving off a very small amount of X-rays, while recent VLA data indicates the source remains bright in radio waves. This new study indicates that VLA J2130+12 is a black hole a few times the mass of our Sun that is very slowly pulling in material from a companion star. At this paltry feeding rate, VLA J2130+12 was not previously flagged as a black hole since it lacks some of the telltale signs that black holes in binaries typically display. This is the first time a black hole binary system outside of a globular cluster has been initially discovered while it is in such a quiet state. Hubble observations identified VLA J2130+12 with a star having only about one-tenth to one-fifth the mass of the Sun. The observed radio brightness and the limit on the X-ray brightness from Chandra allowed the researchers to rule out other possible interpretations, such as an ultra-cool dwarf star, a neutron star, or a white dwarf pulling material away from a companion star. 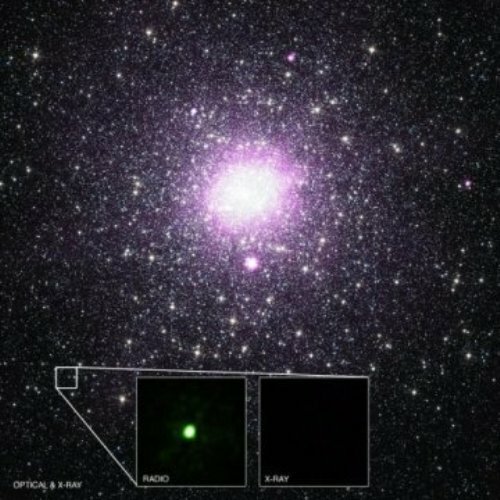 Because this study only covered a very small patch of sky, the implication is that there should be many of these quiet black holes around the Milky Way. The estimates are that tens of thousands to millions of these black holes could exist within our Galaxy, about three to thousands of times as many as previous studies have suggested. “Unless we were incredibly lucky to find one source like this in a small patch of the sky, there must be many more of these black hole binaries in our Galaxy than we used to think,” said co-author Arash Bahramian, also of the University of Alberta. There are other implications of finding that VLA J2130+12 is relatively near to us. Sensitive radio and X-ray surveys covering large regions of the sky will need to be performed to uncover more of this missing population. If, like many others, this black hole was formed in the plane of the Milky Way’s disk, it would have needed a large kick at birth to launch it to its current position about 3,000 light years above the plane of the Galaxy. These results appear in a paper in The Astrophysical Journal. NASA’s Marshall Space Flight Center in Huntsville, Alabama, manages the Chandra program for NASA’s Science Mission Directorate in Washington. The Smithsonian Astrophysical Observatory in Cambridge, Massachusetts, controls Chandra’s science and flight operations. Researchers using the Atacama Large Millimeter/submillimeter Array (ALMA) have discovered a rotating ring containing large organic molecules around a protostar. This observation definitively shows that organic materials formed in interstellar space are brought into the planet-forming region. Researchers also found that the molecular species brought into the planet-forming region vary from one protostar to another. Chemical composition is a new way to answer the long-standing question of whether or not the Solar System is a typical example of a planetary system. Astronomers have long known that organic molecules form in diffuse gas clouds floating between stars. It is thought that as the Solar System formed 4.6 billion years ago, some of these organic molecules were transported from interstellar space to the planet forming disk. Later, these molecules played important roles in the chemical evolution resulting in the emergence of life on the Earth. However, it is still unknown what kinds and quantities of organic molecules were actually supplied from interstellar space. Although radio astronomy observations during the last decade showed that saturated complex organic molecules, such as methanol (CH3OH) and methyl formate (HCOOCH3) , exist around Solar-type protostars, their distributions were too compact to be resolved with the radio telescopes available at the time. With ALMA, an international team lead by Yoko Oya, a graduate student of Department of Physics, The University of Tokyo, and Nami Sakai, an associate chief scientist of RIKEN, studied the distribution of various organic molecules around a Solar-type protostar IRAS 16293-2422A at a high spatial resolution. They discovered a ring structure of complex organic molecules around the protostar. The radius of the ring is 50 times wider than the Earth’s orbit. This size is comparable to the size of the Solar System, and the ring structure most likely represents the boundary region between infalling gas and a rotating disk structure around the protostar. The observations clearly showed the distribution of large organic molecules methyl formate (HCOOCH3) and carbonyl sulfide (OCS). Apparently the distribution of methyl formate is confined in a more compact area around the protostar than the OCS distribution, which mainly traces the infalling gas. “When we measured the motion of the gas containing methyl formate by using the Doppler effect,” said Oya “we found a clear rotation motion specific to the ring structure.” In this way, they identified the rotating ring structure of methyl formate, although it is not resolved spatially. A similar ring structure is also found for methanol. These saturated organic molecules are formed in interstellar space and are preserved on the surfaces of dust grains. Around the outer boundary of the disk structure, they evaporate due to shock generated by collisions of the disk and infalling material, and/or due to heating by the light from the baby star. This result is the first direct evidence that interstellar organic materials are indeed fed into the rotating disk structure that eventually forms a planetary system. In 2014, the team found a similar ring structure of SO (sulfur monoxide) around another Solar-type protostar L1527. In this source, unsaturated complex organic molecules such as CCH and cyclic-C3H2 are very abundant in the infalling gas, while SO preferentially exists in the boundary between the infalling gas and the disk structure. Although the physical structure in L1527 is similar to that found in IRAS 16293-2422A, the chemical composition is much different. Saturated complex organic molecules are almost completely absent in L1527. 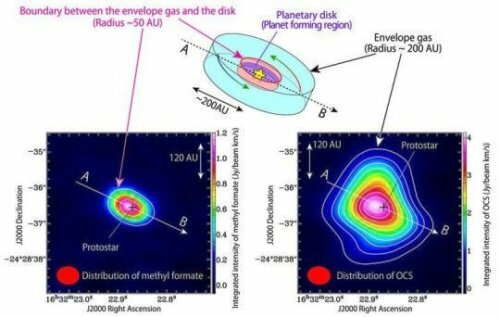 The present result, taken together with previous results on L1527, clearly demonstrates for the first time that the materials delivered to a planetary system differ from star to star. A new perspective on chemical composition is thus indispensable for a thorough understanding of the origin of the Solar System and the origin of life on the Earth. 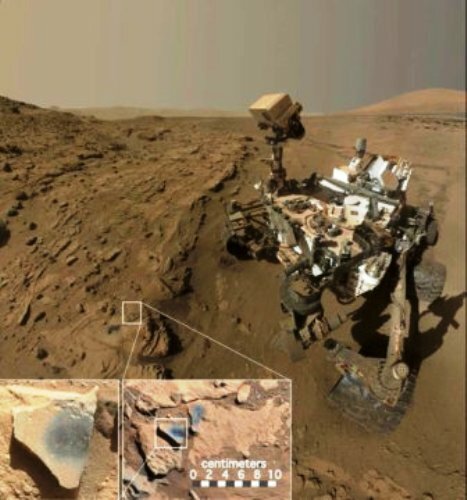 Chemicals found in Martian rocks by NASA’s Curiosity Mars rover suggest the Red Planet once had more oxygen in its atmosphere than it does now. Two massive blob-like structures lie deep within Earth, roughly on opposite sides of the planet. The two structures, each the size of a continent and 100 times taller than Mount Everest, sit on the core, 1,800 miles deep, and about halfway to the center of Earth. Arizona State University scientists Edward Garnero, Allen McNamara and Sang-Heon (Dan) Shim, of the School of Earth and Space Exploration, suggest these blobs are made of something different from the rest of Earth’s mantle. The scientists’ work appears in the June issue of Nature Geoscience. The blobs, he says, may also help explain the plumbing that leads to some massive volcanic eruptions, as well as the mechanism of plate tectonics from the convection, or stirring, of the mantle. This is the geo-force that drives earthquakes. Earth is layered like an onion, with a thin outer crust, a thick viscous mantle, a fluid outer core and a solid inner core. The two blobs sit in the mantle on top of Earth’s core, under the Pacific Ocean on one side and beneath Africa and the Atlantic Ocean on the other. Waves from earthquakes passing through Earth’s deep interior have revealed that these blobs are regions where seismic waves travel slowly. The mantle materials that surround these regions are thought to be composed of cooler rocks, associated with the downward movement of tectonic plates. The blobs, also called thermochemical piles, have long been depicted as warmer-than-average mantle materials, pushed upward by a slow churning of hot mantle rock. The new paper argues they are also chemically different from the surrounding mantle rock, and may partly contain material pushed down by plate tectonics. They might even be material left over from Earth’s formation, 4.5 billion years ago. Much is yet to be learned about these blobs. But the emerging view from seismic and geodynamic information is that they appear denser than the surrounding mantle materials, are dynamically stable and long-lived, and have been shaped by the mantle’s large-scale flow. The scientists expect that further work on the two deep-seated anomalies will help clarify the picture and tell of their origin.